The Creatinine colorimetric detection kit utilizes a single-step liquid detection reagent that is safer and less time consuming than other assay methods. This kit is calibrated against the NIST standard and offers reproducible results with less than 6% inter- and intra-assay variation. Application Notes: For the quantitative determination of urinary creatinine from any species. Scientific Background: Creatinine (2-amino-1-methyl-5H-imadazol-4-one) is a metabolite of phosphocreatine (p-creatine), a molecule used as a store for high-energy phosphate that can be utilized by tissues for the production of ATP. Creatine either comes from the diet or is synthesized from the amino acids arginine, glycine, and methionine. This occurs in the kidneys and liver, although other organ systems may be involved and species-specific differences may exist. Creatine and p-creatine are converted non-enzymatically to the metabolite creatinine, which diffuses into the blood and is excreted by the kidneys. In vivo, this conversion appears to be irreversible and in vitro it is favored by higher temperatures and lower pH. 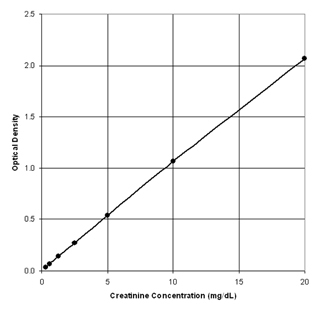 Creatinine forms spontaneously from p-creatine, and under normal conditions, its formation occurs at a relatively constant rate. Intra-individual variation of creatinine levels is <15% from day to day, making it a useful marker for normalizing levels of other molecules found in urine. Altered creatinine levels may be associated with conditions that result in decreased renal blood flow, such as diabetes and cardiovascular disease.